A record of 29-22 wouldn’t typically satisfy the San Antonio Spurs organization and fanbase. But this season, considering all the player movement of the offseason and injuries in training camp, the Spurs should be very happy with where they are as January concludes. San Antonio currently sits sixth in the Western Conference. The team is just three games out of the No. 3 seed and has gone 18-8 in its last 26 games. What’s the biggest reason for this season’s success? Head coach Gregg Popovich is always a big factor. In terms of the roster, though, it comes down to balance. Most people would agree that the Spurs have two stars leading the squad: LaMarcus Aldridge and DeMar DeRozan. Aldridge has made the All-Star game in six of the past seven seasons and DeRozan has done the same for four of the past five years. How is the duo doing this year? The results have been mixed. Aldridge had a wretched start to the year but has recovered with uber-efficient offensive play since December started. DeRozan carried the Spurs’ offense in October and November but hasn’t looked close to elite on offense since then. The Spurs should be thankful that their main two guys’ slumps haven’t coincided. Otherwise, San Antonio would probably be out of the West’s top eight right now. No one should be surprised if the Spurs don’t have an All-Star representative this year. 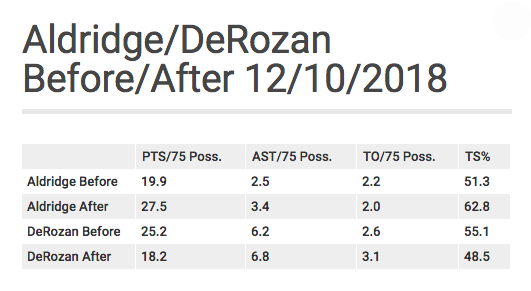 Recency bias could get Aldridge in the game, but both his and DeRozan’s extended slumps should factor into the voting. Impact metrics support the assertion that the Spurs are not very dependent on their stars. DeRozan leads the Spurs in RPM Wins (3.86), but that ranks just 55th in the NBA. Aldridge paces the squad in PIPM Wins Added, but again, he’s just 46th there (3.7). The rest of the West’s top seven teams all have at least one player in the top 14 of both metrics. A lot of the Spurs’ success has come due to players outside of their top two, starting with options Nos. 3, 4 and 5 in the first unit. Rudy Gay, Derrick White and Bryn Forbes have all stepped their games up significantly since last season. Gay’s athleticism and stamina are back to his pre-Achilles injury levels this season. He combines the length and strength of a big man with the shooting and ball-handling abilities of a wing. He’s not pushing for an All-Star spot, but he’s a top-50 to 70 guy in the league this season by most measures. The Spurs are quickly learning what kind of two-way weapon they have with White. The 6’4″ combo guard is a crafty offensive player with a good scoring touch and passing vision. He’s probably even better on defense, with his non-stop motor and disruptive hands. Since making his season debut on November 7, he leads all guards in total shot contests. Forbes is easily the weakest link of the group, but he’s still a serviceable starter. His 42.7 percent shooting from three-point range is vital to the team’s spacing. His defense is still below-average, but it’s gotten better. Per BBall Index’s talent grades, his league-wide perimeter defense percentile has improved from 43.9 to 50.9 since last year, and his interior defense percentile has gone from 13.6 to 37.1. San Antonio’s starting lineup won’t overwhelm most of its counterparts. But they’re a respectable group with five guys who are all at least decent players. The Spurs’ bench doesn’t have any flashy players or trendy candidates for Sixth Man of the Year, but it’s still arguably the best reserve mob in the NBA. So how do you explain their success? Chemistry and balance are what makes San Antonio’s reserves so effective. In particular, the four-man combination of Patty Mills, Marco Belinelli, Davis Bertans and Jakob Poeltl has developed into a nightmare for opponents. They dazzle fans with ball movement, screens, off-ball cuts and three-point shooting galore every time they step onto the court. All four players are a threat to score or find someone else for a score. There are some issues in certain matchups defensively because the Spurs’ bench players are mostly quite limited physically. However, the group’s offensive brilliance usually overshadows its defensive struggles. Of the Spurs’ 20 most used four-man combinations, it’s the aforementioned quartet that dominates opponents the most, with a plus-24.1 net rating in 221 minutes together. Of course, they are playing against mostly bench units and often with a capable facilitator like DeRozan or White as their fifth guy, but the statistic still holds plenty of weight. Right now, it’s those four guys (Mills, Belinelli, Bertans and Poeltl) who are getting the most minutes off the bench right now. Dante Cunningham was a rotation fixture to start the year, but he doesn’t have a consistent role anymore. Gasol and Pondexter have played sparingly. How good are those four guys? 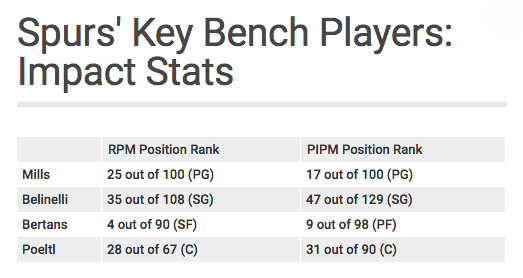 Two key impact metrics, Real Plus-Minus and Player Impact Plus-Minus, estimate that all of them are well above-average players at their positions. First of all, the Spurs’ 1-to-9 gap is minuscule compared to that of most of their fellow West playoff teams. Elsewhere in the West’s top eight, you have players like Quinn Cook and Alfonzo McKinnie (Warriors), Torrey Craig (Nuggets), Patrick Patterson and Dennis Schroder (Thunder), Nik Stauskas and Evan Turner (Trail Blazers), James Ennis (Rockets), Royce O’Neale (Jazz) and Avery Bradley and Marcin Gortat (Clippers) soaking up big minutes despite being below-average rotation players, at least according to impact metrics. The Spurs don’t have anyone like that, but they also don’t have the star power of most of those teams. NBA advanced stats expert Nathan Walker has a statistic called SPR, which estimates player impact on the court using a box score-based metric that adjusts for pace. He broke his data down and sorted every team’s 1-through-5 versus 6-through-10 (in total minutes played) by SPR. As of January 24, the Spurs’ total 1-through-5 SPR ranked 20th in the league (plus-3.5). However, their 6-through-10 SPR (plus-5.7) was first in the NBA by a wide margin. The Hawks and Cavaliers were the only other teams with a higher SPR from 6 to 10 compared to 1 to 5. San Antonio should continue to win plenty of games for the rest of the season with its current roster setup. It’s a big deal to have no real liabilities in the rotation and a bench that constantly extends leads or chips into deficits. Because the Spurs have that strong depth and a good second facilitator in White, they should stay conservative with DeRozan’s workload over the regular season’s final stretch. His minutes (35.4) have been very high this season, but he’s about to get his fourth game off in six contests on Tuesday to manage some knee soreness. As for the postseason, the Spurs absolutely need Aldridge and DeRozan to play well simultaneously if they want to make it out of the first round. A small 1-to-9 gap isn’t necessarily a bad thing for a playoff team. But it’s not helpful if that is the case because the 1 and 2 aren’t playing like superstars. San Antonio also needs to find more solid five-man units that can compete with the best lineups of its potential playoff foes. The members of the Spurs’ vaunted bench (except Bertans) won’t be able to play for long stretches in the postseason against the West’s best players and five-man groups. With Popovich at the helm, though, it seems like anything like possible. So let’s just sit back and watch this pleasantly surprising season continue to unfold.. Note: All statistics are from NBA.com, ESPN, BBall Index or Nathan Walker. A link to Walker’s Patreon is here. All RPM and PIPM stats are updated through games played on January 27. San Antonio Spurs Writer at BBall Index. Follow Jared on Twitter @jaredtjohnson21.